Europe needs to become a stronger player in the global economy, where ICT is a proven enabler of growth that underpins almost every sector. It is our shared responsibility to foster professionalism and ensure that a competent workforce is capable of attracting work to our part of the world. The European e-Competence Framework (e-CF), as a formal norm, is the foundation for fostering professionalism in this industry. Currently, the market has trouble recognizing the value of this norm. In the first article we provided basic information on the phases in the use of the e-CF, types of standards and their benefits to different users in several settings. We demonstrated that user groups have different needs in terms of effect and value in adopting a standard. We distinguished three levels of users of the e-CF and five types of standards. The timetable and focus used for action is the last variable we mentioned. We maintained that for the e-CF to be adopted on a larger scale, further differentiation and typing is needed and a strategy must be developed to guide this process. In this article we will describe how the e-CF ecosystem should be designed and how differentiation and typing could be done. We use a layered concept whereby the relations between stakeholder groups are the main focus. In the following article, different scenarios will be formulated according to the three user levels mentioned in the first article. We believe that for the e-CF to be widely adopted, it is essential to choose the right approach for the right group (and their stage /timetable). The process of development of the e-CF has so far been based on garnering consensus, raising awareness among stakeholders and finding common views to establish a common language. If we look at the development of new standards in general (used freely from Hampson-Jones 2011 in “A World Built on Standards”), we see that after the concept is born, the architecture and requirements are the first issues that need to be tackled. Terminology standards are used initially to effectively communicate the vision and - once the first rough draft designs are written - measurement standards will need to come into play at the detailed design stage, the building stage and the launching stage. The communicative function: language is used to communicate with others for instance to inform or simply to entertain each other. The conceptualizing function: language is used to organize reality. Through language, one gets a grip on reality by referring to shared meanings and concepts. A language appoints reality and describes relationships. The expressive function: to express personal emotions. We focus only on the second distinction as the maturity of the e-CF has already reached the first purpose. 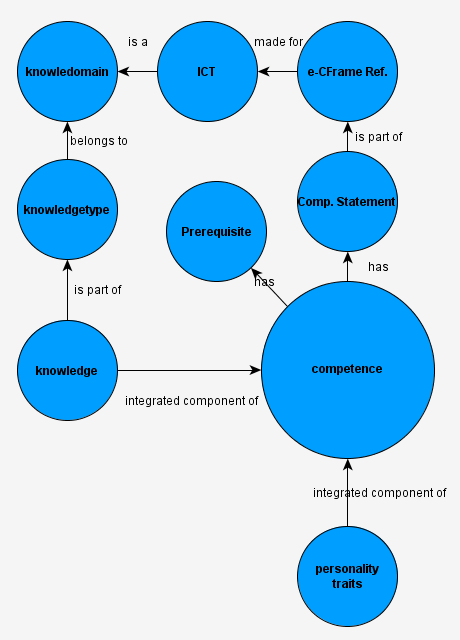 In the conceptualizing function, the e-CF uses its structure in four dimensions; competence areas (dimension 1) competences (dimension 2), level assignment for each competence depending on nature and range of related activities (dimension 3) and short sample specifications of knowledge and skills (dimension 4). It is assumed is that these levels can be adapted and customized into different contexts to accommodate different ICT business and stakeholder application perspectives. In the cycle of development and validation of innovative standards, this may be sufficient for the first cycle of development as a framework. The result will be a general clarity of concepts and definitions and the standard will be of the terminology type as we pointed out before. To make the design of the language more clear we draw the e-CF (as is) below, as concepts in relation to each other. The different concepts have to be worked out in more detail of course. We will do this for the main construct: Competence. We see in the figure above that there are different levels one can have knowledge about a particular subject, and that one knowledge level is prerequisite for obtaining the next. The higher levels (understanding and design) contribute to knowledge of the central concept through cognition. Cognition encompasses the higher order processes to apply knowledge in a broader perspective. Cognition is a capacity of the carrier of the competence, the individual professional. When people do not have this capacity, no higher order reasoning functions can be applied. The higher order knowledge levels are thus directly connected to personality traits. These traits are also influenced by more variables such as regulation and affection, for instance. The middle level, understanding, is also directly related to knowledge in the skills area of e-CF. We have known for a long time that the way people use their knowledge and skills as professionals makes a real difference in how they perform. The possession of knowledge and skills is just part of the package. In the e-CF this is all comes together as ‘attitude’ which is supposed to ‘glue it all together’, but we feel that one concept is not enough to fully represent the phenomenon. In the figure below, we illustrate the idea of integrating the different aspects of a personality that are involved. We see that affection is an important variable in how knowledge and skills are mobilized in practice. If a person is intimidated when speaking in public, for instance, or for the board or a specific person, their knowledge and skills can be influenced substantially. People do not function as well as they would normally, without this interference. We see that cognition plays a big part in how a person can use their knowledge and skills in a certain situation. For instance, it makes a difference if learning is easy for this person and if he/she can make assumptions or adaptations into other areas based on the knowledge and skills he/she already has? We see that regulation is very important in guiding it all. Is a person aware of his/her knowledge gaps and can he/she deal with criticism and thus create the opportunity to elaborate on their existing knowledge and skills? Does their ego get in the way of carrying out specific processes or seeing their own potential contribution? Is a person capable of letting go of their original ideas or thinking out of the box? As argued before, in the first article, the current stage of development of the e-CF only allows for benefits in terms of reduced transaction costs and networking, but only if customization and specific application and reference towards organizational needs is not done too extensively. The e-CF is in the reference framework stage and without the interpretation of this reality by a user, no social application will occur. The next phases in the adoption process require a higher granularity, such as the phase of detailed design complemented with measurements, the building and creating of product specific items and interfaces, the phase of integration and testing and finally the launching, operating and maintenance to guarantee the quality obtained. A possible solution is to build services and interfaces specifically for each user group. This approach would require a detailed design based on the generic user group profiles. A performance standard needs clear requirements and safe services to reduce risk and gain confidence. This leads to effective penetration of the market as the cost and effort that new users have to make to enter will be much lower. We distinguish 5 areas of user groups that each have their own ideas and concepts regarding reality. The light blue area represents the e-CF structure in more detail, with competence as the big circle in the middle, as central concept. The dark blue dots are all those aspects that may measure competence in an assessment, the red dots represent concepts related to the individual person as carrier of the competence and the green dots are related to the organizational use of competences. If the social reality of different user groups are made very clear detailed, the relationship with the e-CF and the relations between these groups should be worked out to guarantee future interoperability. A differentiation between instruments used in different types of assessments is also necessary. We distinguish between self-assessment tests, management and organizational instruments, psychological tests and exams. Self-assessment tests merely reflect the personal interpretation of a professional of his/her own competence. Management and organizational instruments are largely based on the interpretations of others of the competence of the professional. Psychological tests, when validated, are based on scientific metrics of psychological capacities and personality traits. Finally, exams can cover knowledge and skills in specific areas. The area relating to assessment is detailed in the figure below. The support currently offered to organizations consists mostly of self-assessment tests or similar instruments; instruments based on a typology that blurs out individual differences and groups people into larger categories by rating their responses. The correctness of self-evaluation of competence is correlated with the processes involved in higher order cognition and if their possessors have sufficient awareness (and are able to capture it well by self-assessing). This related to the affection and regulation aspects of the personality traits which differ enormously from person to person. Several studies on this aspect also show that the predictive validity of self-assessment is impaired for socially sensitive topics, where social desirability may distort the responses. These evaluations are most accurate when the professional has the personal characteristics of high intelligence, high achievement status and a high internal locus of control. There is evidence that the quality of the outcomes is better if the professional has experience with self-evaluation, thinks that the outcome will be compared with set criteria, when the evaluation is anonymous and when a comparison with others takes place afterwards. As the relationship between the individual and the organization is judicial in nature, it makes sense that, if the organization uses the e-CF in addition to M&O instruments already in place, they should be able to trust the framework and its added value should be evident. For this reason, the dark blue assessment area has to be filled in by a party that knows how to predict valid and trustworthy outcomes. This is necessary to push the norm to a higher level of use. Below is an example of what this arena could look like in a network type structure, where the connecting nodes are specified. As you can see in the picture, the organizational relationship does not connect directly with the e-CF core; there is only an indirect connection through the individual and the assessment. One common mistakes is to think that organizations should push the development of the e-CF. The idea that that the integrative aspects of the framework will be preserved while different organizations work out the dark blue assessment area independently is unrealistic. Another difficulty for businesses is upgrading to a new version of the e-CF. In the concept as is, any upgrade forces organizations to start again from scratch in applying the standard, which is a major issue in the initial adoption of the norm. The essence of taxonomy is to provide a logical structure that brings meaning to what is presented. The outermost layer in this structure is the choreography, where the focus is on how meanings are affected when dispersed across various groups, across time and through usage. If this is taken into account, the next type of standard (Compatibility) comes within reach. By making a layered system, variation across groups and time can be classified and innovation and scaling of the e-CF can be done in a more controlled and coherent manner. The choreographic layer will bring the variation that any user group needs to fulfil their specific goals. In the user group profile, a specific context, as mentioned in e-CF version 3, can be accounted for. The context is here not one specified to the level of one company and their detailed functions, but is generic for the target group, consisting of the users that share the same reference goals. The CEN PC/TC is in charge of updating, growing and maintaining the e-CF. Structuring and profiling for the sake of interoperability in the market can be done by other parties. Massive adoption is possible only if and when the norm is developed to this level of the standard. In this article we demonstrated that differentiation within the e-CF will support adoption and at the same time bring a high level of quality to the standard. Further development of the e-CF, which is needed for this higher level of standardization, can be performed in a layered way. Differentiation between several types of standard and an ontological view are essential in order to form and maintain a living e-CF ecosystem where different parties have different interpretations of reality and explore different goals. To throw them all on one heap and wait for organic growth to happen will not work. For the benefit of further development, profiles based on shared meanings of concepts should be developed in a structure that is more explicit and clear to the different user-groups. An easy upgrade process should also be put in place before organizations will want to participate and use the e-CF. Lobbying for more commitment from the market may be best done where particular user groups have the drive, authority and expertise required. If this distinction between user groups of different levels is not made and the expertise is not narrowed down to more specific areas of focus, the parties involved will not be drawn into the e-CF and the e-CF will not flourish into maturity.